Size: Select 1 Gallon 16 oz. 32 oz. Synthetic lubricant developed exclusively for high rpm racing engines. R-50's film strength is compatible to castor oil with the benefits of clean burn technology . This is everything you want in a 2 stroke oil. High castor esque protection in a synthetic oil, so it burns a lot cleaner, minimal smoke, and one of the best smelling oils out there. Un burned it smells like cherries, but once you fire up your 4 stroke eating machine, it smells like heaven. It may even be better than Castor 927 in terms of scent. Very good oil and smells GREAT!!! Best 2 stroke oil ever made. I run this in my banshee and it works and smell great. Will never use a different oil it is worth the money. Great smell people behind me at the races always comment on how my ride smells amazing . Overall it’s a quality oil most shops don’t carry it rocky ships oil ground only FYI. Only oil I use you won’t be disappointed!!!! This is one of many top quality pre-mix oils. There is no single best oil out there but this is one of the few i trust mixed at 44 to 1. This oil burns very clean , if you have been too glamis or Dumont dunes then the smell will remind you of the drag Banshees running the hills on methanol ! Fantastic oil and fantastic smell !!!! I run this oil in a 1993 Cr500, and a 1992 Kx500. Excellent protection, and a great smell. Love this stuff. Klotz r50 is the best oil on the market. Recently switched to r50. It's amazing oil and same great klotz smell. The best 2 stroke oil out there! We have been running this in our machines for as long as I can remember. ATC250r, TRX250r, CR250, etc. We run Klotz in our snowmobiles as well. Klotz smells good, doesn't gum up powervalves, and is affordable. Recommended. Klotz is the only way to go with 2 stroke engines! Great premix. Have ran Klotz R50 in all my 2 strokes mixed 32:1. This Klotz oil is great! Shipped quickly, but it is perfect for my 2-stroke. Love that sweet smell of Klotz! This is the only oil we use in all our 4mil banshees. I use this in my 65sx and all my chainsaws and weedeaters. No rebuilds yet so it must be good. 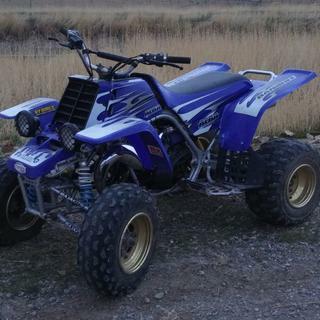 -m-2005 YAMAHA RAPTOR 660-- well this is oil for a two stroke bikes, that is good oil I use all the time. We mainly started using this oil because it is tinted red. It's nice to have that reassurance that the fuel has been pre-mixed. As far as longevity, our bikes have been going strong with it. No premature wear. The price is very reasonable compared to some competitors. Love it best smelling oil and burns very clean no fouling plugs. Consistently get 100 hours on a top end when using Klotz. Good oil. Smells good. I like the super techniplate a little more. The stuff works amazing and smells good too! When the temperatures are low, this is my substitute for Klotz Benol. It smells great, and burns cleaner than Yamalube 2R. My sons 2 stroke kept going through pistons until we started running R-50. This is the best 2 stroke oil we have burned. Plus it smells great. 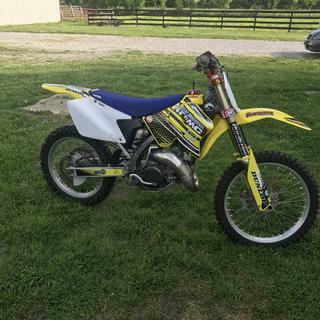 Used this when I had my 2004 CR250R and it burned clean and after thirty hours on the top end the cylinder still looked brand new!!! Guy I sold it to said he'd never seen a two stroke with 30 hours on it and have as much compression as my bike had and he'd been racing for years! Plus it smells really good! I have been using this oil in my banshee for a long time. I absolutely love it. The same mix that goes in my banshee goes in my chain saw, my weed whacker, my leaf blower, and my ice auger. I will not buy anything else but klotz.Oh yeah, the smell is my favorite! I've been using this stuff for years in my 2 stroke 250 woods bikes. Great protection and smell!! The only downside is it doesnt burn as clean as some of the HIGH end oils, but hey, for the protection I'll take a little gunk from the silencer! Plus in 10 years or so of racing, I've fouled 1 or 2 plugs. Can't beat that. Smells good and Protects better! R-50 works great but is getting expensive. But aren't they all. Really good oil, keeps everything well lubed. Doesn't smell the best. I have used Klotz R50 in my Kawasaki 2-stroke triple dragbikes for years and never had an engine failure caused by lubricant breakdown. These engines are subjected to the severest abuse imaginable. I wouldn't risk running anything else in my bikes. Who cares what it costs? Oil is cheaper than motors! Furthermore, properly mixed, it runs very clean. I have been using R-50 for over 15 years in my 96 CR500 and my sons CR250. I mix it at 50:1. We ride hard at the dunes running at max RPMs and I have never burnt a moter down or seized up. A great oil IMO. New to 2T but so far I am loving this oil. One of the best parts is it smells great! Silly I know, but makes a difference in the way you feel about your bike, at least for me. Decent price compared to other oils. Love this oil. The way it burns and smell's. only oil I run for 2 Stroke oil. GREAT PRODUCT!!! This oil has made my engine run better and longer. I cant explain it but all the stuff they say on the bottle must be true. I feel a difference in how the engine runs it feels smoother like there is less friction. Best oil you can buy! I have used R-50 for 20 plus years, in my race bikes, weed whips, chainsaws and even put a little in my lawnmowers first tank of fuel every spring. When cutting firewood with friends everyone loves the syrupy smell of my saw. Decent price and smells good to boot. whats the difference between klots r-50 and klots techniplate? 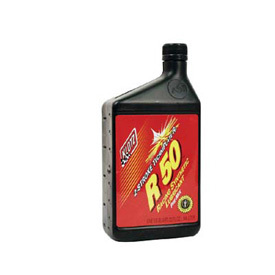 BEST ANSWER: They both are designed for high heat high rpm engines, R-50 is fully synthetic. The super-tecniplate is a synthetic Blend with 20% BeNOL for maximum film strength. The R-50 burns a little bit cleaner in my experience. Being designed for constant high rpm engines, they both can make powervalves gum up fast if used for trail riding or a lower rpm motor, the super tecniplate gums up even faster because of the BeNOL. If you do not have a powervalve on your two stroke they both function similar. Also if you want a good Klotz for powervalve exhaust two strokes that are lower rpm or trail ridden the tc-2 or tc-3 types are great but getting harder to find. I race woods so I don’t have low rpms at most times. What would you recommend? Klotz TC-W2 motorcycle premix if you can find it at shops near you or elsewhere online. (Blue label bottle) R-50 if you can’t find the other type, or ride in high heat mostly. If you are just looking for a good premix that burns clean and won’t smell too terrible MOTOREX crosspower 2t is also a good choice. BEST ANSWER: The mixing ratio is determined by the manufacture for each machine. For most bikes, the recommended ratio is 32:1. Be sure to check your owners manual for the proper specifications. Does the gallon of r-50 come in 4 separate quart containers or a gallon jug? BEST ANSWER: It comes in a 1 gallon jug.